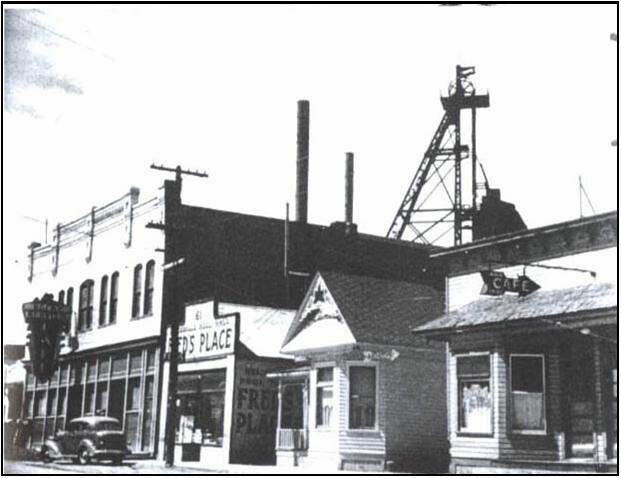 In 2010 EPA interviewed local citizens and reviewed the status of Butte area Superfund sites as part of a required five-year review (the full review report is available here). Five-year reviews determine whether remedies or other response actions are protective of human health and the environment in compliance with a site’s decision documents. Methods, findings, and conclusions are documented in five-year review reports that identify issues found and make recommendations to address them. The 2010 review identified six main issues related to the Butte Mine Flooding Operable Unit (BMFOU), which includes the Berkeley Pit. All involved the performance of the Horseshoe Bend Water Treatment Plant, which was completed in 2003. The plant currently treats contaminated surface water flowing in from the north. This water is diverted away from the Pit, slowing the rate of rise of the water. Eventually, when the water level at any compliance point reaches the Critical Level of 5,410 feet, the plant will pump-and-treat Pit water to keep levels below that critical point. A performance test was conducted at the plant in 2007, and that data was considered in the 2010 review. All treated water is currently recycled to Montana Resources active mining operations and is not discharged to Silver Bow Creek or any other surface outlet, Consequently, EPA identified all issues in the review as potential future issues that do not effect the current protectiveness of the remedy. Montana Resources does not allow any water to discharge from the Berkeley Pit and active mine area. Water treated at the plant did not meet the final pH standard. pH measures the acidity of a liquid. The pH is purposely raised to over 10 in order for it to be used as operating water in Montana Resource’s mill. Discharge standards only apply when water is discharged to Silver Bow Creek. 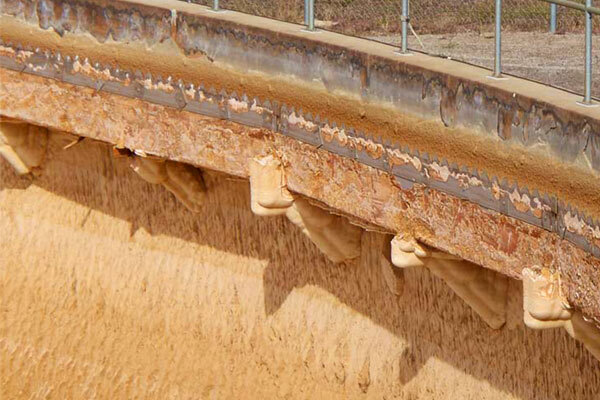 This photo from EPA’s 2010 five-year review report shows gypsum scale build up on the lip of the treatment plant clarifier overflow. During the water treatment process, gypsum sometimes builds up, or ‘scales’, on the inside of tanks and pipes. This leads to a need for additional maintenance, as parts of the plant must be shut down for a short period each year so that crews can remove the build up. Measures to help manage and reduce scaling are being evaluated, and gypsum concentrations are monitored weekly. Testing showed that treated water at times did not meet the standard for cadmium, a toxic metal. After adjustments were made to increase the pH, the standard for cadmium was met. The 2007 performance test measured treated surface water from Horseshoe Bend. While this water is similarly contaminated, Pit water has higher concentrations of toxic metals and sulfate. This issue is closely related to issue 2. To reduce gypsum scaling on critical pipelines and pumps, scale inhibitors are used. These chemical additions make it more difficult for gypsum to precipitate out of treated water and build up in the plant. Their effect on metals removal was a concern, but studies have shown no discernable effect of inhibitors on metals removal. Whole Effluent Toxicity (WET) is a measure of the total toxic effect from pollutants in treated wastewater on aquatic life. In 2010, WET testing had not yet been performed on treated water. Treated water is currently recycled in active mining operations, so it is no threat to aquatic life. Preliminary WET testing was completed during pilot testing using Horseshoe Bend water. Results showed the chronic exposure concentration with the lowest observable effect was 75% treated water mixed with 25% dilution water. More WET testing is planned. EPA recommended that an additional performance test be completed prior to the 2015 five-year review to investigate all six of these issues and possible solutions. EPA also noted that operations and maintenance at the plant are now more focused on preventative care, and operations in general have been optimized. After adjustments, treated water met all discharge standards with the exception of pH (issue 1). In order to be protective in the long term, the various water quality issues in treated Pit water will have to be resolved before discharge to Silver Bow Creek becomes necessary. As long as Montana Resources continues active mining at the Continental Pit, no discharge is expected to occur. Recommendations for additional performance testing will be addressed by treatability studies starting in 2016 and concluded by 2019, well before any discharge would potentially occur. EPA determined that the ongoing remedy for the Pit is functioning as intended. When the water approaches the Critical Level, additional testing will help to further refine plant performance. The 2015 five-year review of Butte area Superfund sites will be published later in 2015, and will be available online here and on the EPA’s Butte Superfund website. Interested citizens should contact EPA with any questions or comments regarding the 2010 or 2015 site reviews.